Android is one of the most popular mobile operating systems available today. Many mobiles and tablets run on Android. Besides the smooth touch interface of the OS, the most appealing feature is the support for a wide range of Apps. Android apps have become popular over time and being open source, thousands of new apps are released every week. But unfortunately, these apps are only supported on Android devices. Sometimes we may want to run Android apps on our PCs to test apps for projects or just to experience the fun of Android on PC. There are several ways by which you can make these apps run on your computer. 1. 32 Bit users can try installing Android x86 – a modified Android OS specially built for PCs. But it runs on a very limited memory and not all Android Apps can run on it. 2. If you prefer running Android apps within Windows, you can install the Android SDK. But running the SDK takes up a lot of memory and response times are slow. 3. The best way to run Android apps on PC is by running it inside Bluestacks App player. This utility is a simple desktop program that lets you run Android Apps in full screen mode. Bluestacks provides a decent phone-like interface and lets you access Android apps from your PC and install it within Bluestacks. 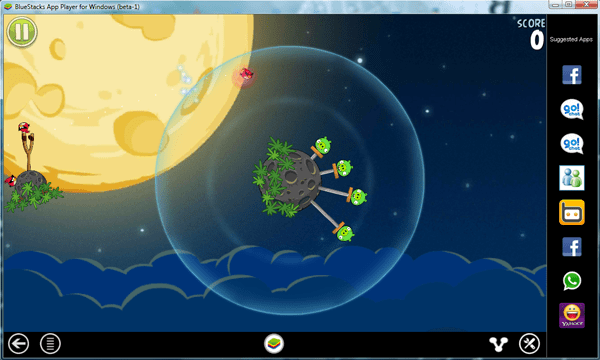 In other words, Bluestacks provides a virtual framework on which the Android apps can run. Just download the Bluestacks App player from the website and install it. Windows XP and Vista users may need to upgrade the Service Pack version for the installation to succeed. Windows 7 and Windows 8 already supports Bluestacks. After the installation is done, open the program and try out some of the preinstalled apps. You can also run your custom Android apps by just double- clicking on the application installer (.apk) file. The app will be automatically installed and can be accessed within Bluestacks.